I greatly appreciate your support throughout these past two years. 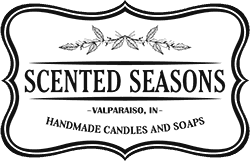 I know there are many other candle and soap companies to choose from. Your enthusiasm and loyalty to my products is why I love doing what I do. The cost of operating this business has increased over the last two years. Therefore, effective November 1st, the price of our 8 oz. jar candle will increase to $10.00 and the price of our 16 oz. jar candle will increase to $19.00. This slight price increase will allow me to continue offering only the best 100% soy candles containing the most fragrant essential oil combinations. As always, sales, bundled deals and other discounts will still be offered throughout the seasons. Please sign up if you haven’t already for our email newsletters so you can be the first to know of upcoming offers! Please don’t hesitate to contact me. Click over to the ‘Contact Us’ page if you have any questions. I can’t thank you enough for your support and look forward to serving you in the coming seasons!